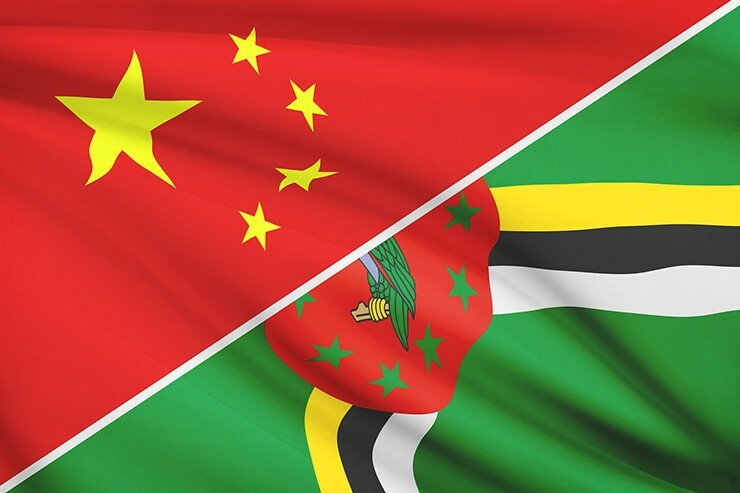 March 23rd in 2004 was a very special day for the People's Republic of China and the Commonwealth of Dominica as our two countries established diplomatic relations on that day. Since then, we have worked to promote the development of bilateral relations on the basis of mutual respect, equal treatment and win-win cooperation. 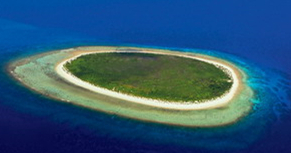 China-Dominca relations have set up a model for large and small countries to get along with each other. The past 15 years has seen frequent high-level visits which deepened mutual trust between our two countries. In 2005, Hon. Roosevelt Skerrit, Prime Minister of Dominica paid an official visit to China. In 2013, during an official visit to the Republic of Trinidad and Tobago, H.E. Xi Jinping, President of China met with Hon. Skerrit. In addition, from the Chinese side, Gu Xiulian, Vice Chairman of the Standing Committee of the National People's Congress, Chen Changzhi, Vice Chairman of the Standing Committee of the National People's Congress, Wang Jiarui, Minister of the International Department of the CPC Central Committee, and Yang Jiechi, Vice Foreign Minister have visited Dominica. From the Dominican side, H.E. Eileen Alix Boyd Knights, Speaker of the House Assembly, has visited China, and Hon. Francine Baron, Foreign Minister, Hon. Petter Saint Jean, President of Dominica Labor Party and H.E. Lennox Linton, Leader of the Opposition United Workers Party have attended important conferences in China. The past 15 years has seen expanded cooperation with fruitful results. In the infrastructure sector, China has helped with the construction of the Windsor Park Stadium, the New Town Primary School and the York Valley Bridge. Projects such as the reconstruction of the West Coast Road as well as its rehabilitation post tropical storm Erika, and the reconstruction and expansion of the Princess Margaret Hospital have been conducted. China has also helped to build the Presidential Palace, the Dominica State College and the Roseau Valley Resettlement Houses through excellent loan projects. In the agricultural sector, China has sent experts to conduct agricultural technology cooperation for more than ten consecutive years, providing advanced agricultural production technology and a variety of fruits and vegetables. In the education sector, China offers government scholarship to around 10 students from Dominica each year and more than 170 Dominican students have studied in China so far. In 2018, bilateral training courses arranged in China were provided for about 50 technicians. In the medical sector, China has sent a number of medical aid teams to carry out medical technology cooperation. The pragmatic cooperation between China and Dominica widely benefits the Dominican people. The past 15 years has seen increased people-to-people exchanges. All-China Youth Federation, the Chinese People's Association for Friendship with Foreign Countries, the Guangdong Friendship Delegation and the Guangdong Art Troupe have visited Dominica. Dominica journalists delegation, youth delegation and cadre investigation delegation of Dominica Labor Party have visited China. Dominica also participated in the Shanghai World Expo in 2010. In October 2018, the Chinese Navy Hospital Ship Ark Peace visited Dominica for the first time, providing free medical services and humanitarian assistance for more than 5,000 local people. Those exchanges have strengthened the friendship between the two peoples and built an important bridge for the development of the China-Dominica relations. As a Chinese saying goes, a friend in need is a friend indeed. On September 17th, 2017, category 5 hurricane Maria hit Dominica. As the Chinese Ambassador to Dominica, I witnessed that the Chinese government provided 800,000 USD humanitarian cash aid immediately and expressed our condolences. Then, we worked with UNDP and launched a 3 million USD Roof Restoration Project. We also donated vehicles for civil use, such as ambulances, fire engines and pickup trucks. In order to help Dominica's post-disaster recovery and reconstruction, China has overcome various difficulties to promote the resumption of the West Coast Road Rehabilitation Project and the Government Resettlement Houses Project as soon as possible. In addition, we have agreed to add cement roofs, anti-hurricane doors and windows to the China-Aid New National Hospital. It demonstrates that our friendship is invincible, even in the face of hurricanes. Distance cannot separate true friends who feel so close even when they are thousands of miles apart. China and Dominica are such friends who have worked together to bring their relations to a new level within just 15 years, despite our distance and our differences in size, population, social systems, history and culture. China has always maintained that all countries are equal, however different they are in size, strength or wealth. We respect Dominican people's right to choosing their own way of development. We will never interfere with Dominica's internal affairs or impose our will on Dominica. Nor will any political strings be attached in our assistance to Dominica. Likewise, Dominica has adhered to the One-China Principle and never had any official or unofficial associations with Taiwan since the establishment of diplomatic relations with China. Dominica recognizes China's development model and complete market economy status, and supports China's Belt and Road Initiative, laying a solid foundation for the development of China-Dominica relations. In recent years, some western countries have maliciously accused China of ulterior motives in its aid. However, Dominican Prime Minister Skerrit stood up for China and insisted that, "China has not made any undue demands on Dominica or seek to impose its will on the island and what China has been doing every step of the way is to assist Dominica in social and economic development". 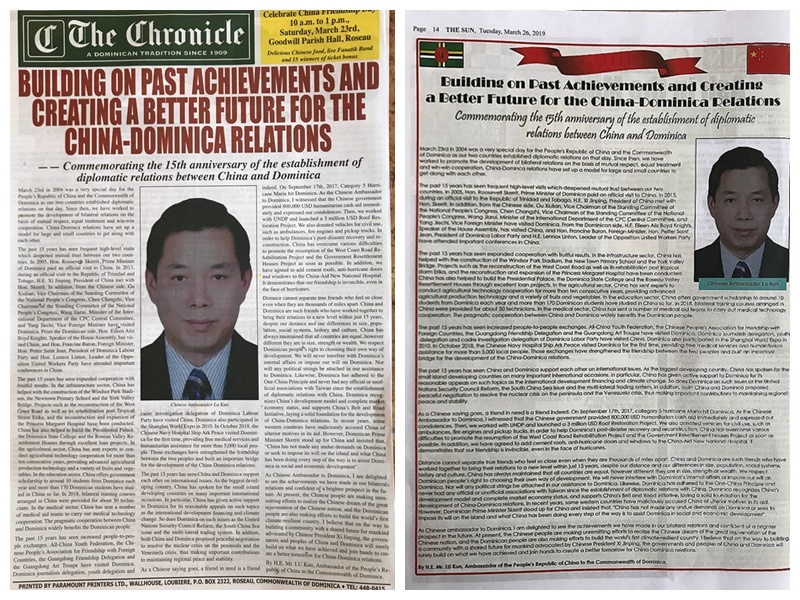 As Chinese ambassador to Dominica, I am delighted to see the achievements we have made in our bilateral relations and confident of a brighter prospect in the future. At present, the Chinese people are making unremitting efforts to realize the Chinese dream of the great rejuvenation of the Chinese nation, and the Dominican people are also making efforts to build the world's first climate-resilient country. I believe that on the way to building a community with a shared future for mankind advocated by Chinese President Xi Jinping, the governments and peoples of China and Dominica will surely build on what we have achieved and join hands to create a better tomorrow for China-Dominica relations.